4/22/2019 6:00:02 AM - We finished rehearsal by 3:30 and did an in-store event at the Shibuya HMV (Henry and I played 3 songs together: "I'm Still Here," "Hung Up" and "I Couldn't See") and then I did an autograph session of those who had bought "Routes." 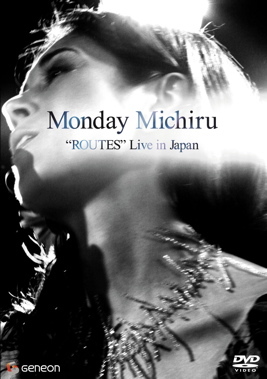 Apparently "Routes" was #1 for 2 weeks since its release at the shop, which was nice news! The next day (26th) was my big day performing with my mother at the Tokyo Bunkakaikan. I left early to rehearse with her one last time at the Yamaha rehearsal space in Shinbashi for a little over an hour, going over the program. Mama was still having a hard time grasping "The Island" and my song, "Heal," but otherwise everything else was in good shape. Someone from the Bunkakaikan came to pick us up at the hotel. When we arrived, the person who I had been corresponding with regarding this event, Fujino-san, came to greet us, but then there was a little confusion where he said, "She's here?" and went outside to the taxi where the man who'd picked us up was paying the fare. I thought perhaps Mama had arrived early, and looked out as well, but only saw the taxi we'd ridden in. Fujino-san came back in looking a little lost, then the man who picked us up came in and gestered to me, saying, "THIS is Monday Michiru-san." Fujino-san was clearly embarrassed and I had to laugh. He thought I was the make-up artist! I was dressed a bit funky in my Levi jeans and tweed cap, and without a stitch of make-up...! As for the make-up artist, Takashi-san had flown in from New York, timing his vacation to my tour so that he could help me with my make-up and hair for the shows in Tokyo -- can you imagine the dedication and loyalty? TRULY humbling. He'd also brought with him a bunch of Okustan jewelry that Natsuko-san (Hayashi) had lent me for the tour. My jetlag wasn't so bad by then, so I was feeling rested, prepared and strong, and after Takashi got through with my make-up and hair, I felt I was also visually presentable. He offered to do Mama's make-up as well, but she laughed and said, "Pianists are not like singers. People don't come to see what I look like, but to hear me play." A slight put down or dig perhaps? It's no mystery she doesn't particularly care of singers. In fact, most musiciand look down on us, viewing us as not real musicians but mere eye candy, an entertainer of sorts. Whatever. And in all fairness, I agree with a lot of that. The performance itself went well I thought. We opened with "Long Yellow Road" which I'd put lyrics to. I'd actually meant to change them and get them tighter, but ran out of time. I was a little nervous during the 2nd tune, "Sumie," which featured my flute playing. I could feel my muscles around my embouchure tighten, but I didn't make any major mistakes. After that, things got smoother. During "Round About Midnight" on Mama's solo, I came in too early. She was meant to do a chorus and a half, but I forgot and cut her off at half a chorus. She then signaled to me that she'd perform a solo piece afterwards to fill up the time. In fact, she took another solo during the second set that we hadn't planned on as well, which I welcomed and thought broke up the sets well, giving her the chance to show her stuff to her core audience that was bound to have been there that night.